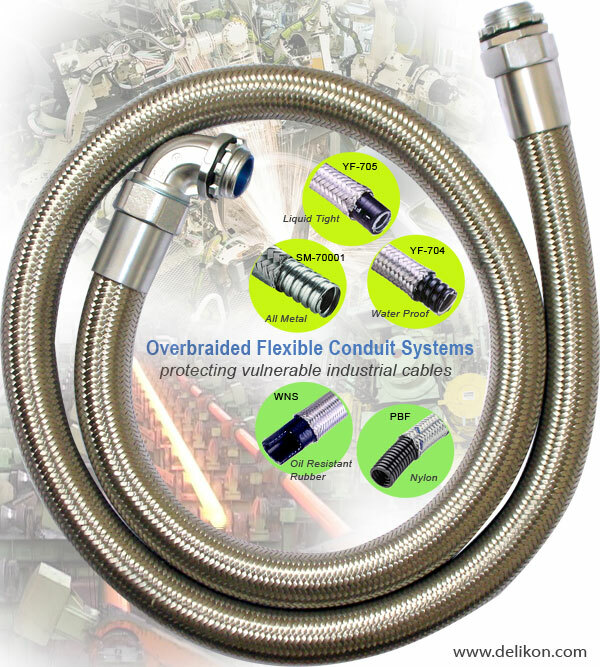 overbraided flexible conduit systems from Delikon offer a choice of a whole range of sizes and constructions to provide the best solution for the most demanding applications. Delikon overbraided flexible conduit systems protect vulnerable cabling on metal machining, welding or heavy plant where abrasion, spillage and increased temperature are all serious operational considerations. They also satisfy arduous demands on railway rolling stock and on essential trackside applications, such as signaling and communications. DELIKON Automation Enhanced fire safety Delikon Low Smoke zero Halogen coated Flexible M..
DELIKON Automation heavy series over Braided Flexible steel Conduit HEAVY SERIES over br..
Delikon automotive industry automation METAL over Braided Flexible Conduit emi shielded ..
heavy series over braided L..
heavy series over braided Liquid tight Conduit heavy series fittings for industry CABLE,..
DELIKON INDUSTRY AUTOMATION high temperature heavy series over Braided Flexible metal Co..
PG npt metric thread liquid ..
PG npt metric thread liquid tight connector,flexible conduit fittings,METRIC PG liquid t..
DELIKON liquid tight conduit and liquid tigh connector for POWER PLANT wiring ELECT..